Guy Opperman's Constituency Diary: My favourite pubs from across our local area! Everyone in our local area knows how lucky we are to have such a great array of local pubs in our area. The Hexham Courant recently put out a call for suggestions for the best pub, so I wanted to set out some of my favourite from across Hexham. I have visited every one set out below and more! Firstly, micro-breweries. The last few years has seen an explosion in the popularity of micro-breweries, and two in Tynedale stand out. The Twice Brewed Inn – which has been here for generations as a pub and guest house – has just opened their own brewery! I visited recently and had the opportunity to see Sycamore Gap – their pale ale – being made. There’s also the Dipton Mill Inn in the Hexhamshire, which is undoubtedly one of the finest pubs in the whole of the County, but also produces their own beer. - and, last but by no means least, The Angel at Corbridge. If you’re looking for food, we have some top gastropubs too. 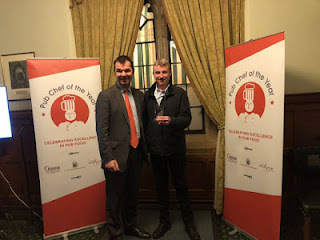 Last year, I welcomed Kevin MacLean of The Rat in Anick, just near Hexham to Westminster where – after a fierce battle with other pubs across the UK – he was crowned Parliamentary Pub Chef of the Year. Their food is top notch, and if you haven’t already, I highly recommend you visit. There’s plenty of other top food pubs too, but some of the standard bearers are undoubtedly the award winning Feathers Inn at Hedley on the Hill, The Barrasford Arms, The Manor House at Shotleyfield, and The Ship Inn in Wylam. We have so many other great pubs too! If you’re looking for great banter and a quiz night, look no further than the Duke Of Wellington Inn in Newton. There are some top super rural pubs, which are great at a weekend, like the fantastic Pheasant Inn in Kielder, and the Redesdale Arms. And if you want left field, go and see the supercars (and more) at the Crown in Humshaugh, and of course Battlesteads in Wark, which contains its very own Dark Sky Observatory. One final point. I will definitely have missed some pubs off a stellar list in Tynedale but the decision is yours – are you going to back your local pub? They are all amazing pubs, and I must confess to popping in occasionally myself! Make sure you use them, or we'll lose them.